According to the Linux Foundation’s 2016 report, 87% of hiring managers have difficulty finding the talent they need, and 79% have increased incentives to retain their current open source talent. Faced with this demand, where can you go to gain the experience necessary to find work? As an occasional designer of on-line courses, one answer I would recommend is the Linux Academy, an online training organization that offers lessons not only in Linux, but also in other open source–related topics, such as Amazon Web Services (AWS), OpenStack, DevOps, Azure, Big Data, and containers, with new and quick training courses being added regularly as the demand increases. Although the Linux Academy does not itself offer certification beyond grading its courses, the intent is to prepare students for existing certification courses, such as the Red Hat Certified System Administrator exam or the credentials offered by the Linux Professional Institute – more than 20 in all. Students can register with Linux Academy either individually or in teams, which adds the possibility of in-person study sessions and training. Study takes place online, either with a Flash-equipped browser or an Android or iOS app that allows off-line study. HTML5 videos, which remove the need for Flash, are currently in development, although in my own series of random tests, they did not run. Figure 1: Linux Academy’s main instruction tool is slide presentations with voiceovers. To judge by the Linux courses of study – the area I am most competent to evaluate – Linux Academy videos maintain a generally high standard. The voiceovers go beyond simply reciting the information on the slides, usually beginning with the narrator’s credentials (Figure 2), then describing the certification that each course is designed to prepare students for, and discussing the prerequisites for the course. The courses then continue in videos ranging from 3 to 30 minutes, mixing both technical instruction and explanation of the open source community. Figure 2: Linux Academy courses begin by giving the instructor’s credentials. Experts might quibble over some of the details of the course. The fact that one instructor pronounces “Debian” as “Dee-be-an” is grating, but trivial. More serious is the emphasis on Red Hat and CentOS in the beginning section of Linux Essential Certification and the relative neglect of Debian and its Ubuntu and Linux Mint derivatives, by far the most popular distributions today. It might be argued that, given the size of the Red Hat company, this emphasis will be the most help for job seekers, although Ubuntu’s prominence in OpenStack suggests the need for more balance. Similarly, although systemd has been a fact of running Linux for several years, I was unable to find any course that mentioned it, let alone one that described in detail its role in administration. Nor is DNF, the new standard Fedora package manager, described; instead, the coverage of RPM package management concentrates on the now-deprecated Yum. Still, despite such issues, in its Linux courses, Linux Academy has usually made a fitting selection and ordering of topics, giving enough information that it accomplishes its aims of preparing students for certification. 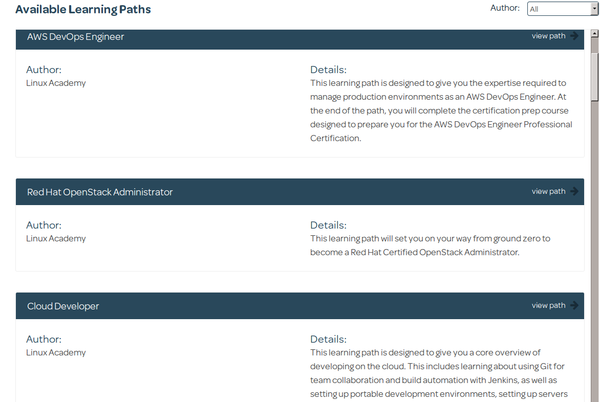 Students begin taking Linux Academy courses by choosing their learning paths – that is, their curriculum and their goals. As they start a course, they can review its syllabus and design a study plan based on their available hours through the week (Figure 3), setting reminders for themselves. Should students fail to keep their self-chosen hours, they are reminded of the fact the next time they start the course for study. If students are part of a corporate team, their managers can set schedules for the entire team. However, whether students are individuals or members of a team, they can export their course of study to their own calendars. Figure 3: Before beginning a course, students identify their objectives and block out their time for studying. The Linux Academy recommends creating study groups, which can be private or public and are overseen by instructors. Justin Overstreet, VP of Business Development, adds that study groups can be further subdivided into smaller groups, more tailored to each student’s particular needs. General online forums are also available. Many courses demonstrate directly from the command line, and students are encouraged to log in and imitate the actions shown in the course. Some courses – although not as many as might be ideal – include lab problems for additional hands-on experience (Figure 4). All courses allow the creation of decks of cards and cards made by other students to help when studying. Figure 4: Hands-on exercises are one of Linux Academy’s most useful learning tools. When students want to test their knowledge, some courses offer quizzes that must be answered in a set period of time, with a minimum of errors. The standards of these quizzes is high, with one quiz failing students with two mistaken answers out of 10. Obviously, the usefulness of these resources depends on how the students use them, although Linux Academy automatically nudges those who fall behind in their schedules. However, the array of resources is thorough, balancing contact with instructors and study aids and compensating for the potential limitations of videos and slide shows. Linux Academy did not give any statistics about the percentage of students who go on to pass certifications. However, anyone who has designed online courses or taken them can see the efforts it makes to overcome the natural limitations of online courses by dividing course material into small chunks and providing additional teacher contact and a variety of study methods, ranging from the hands-on to rote. Based on my sampling, Linux Academy might do more fact-checking and update courses more frequently. Overall, however, it sets high standards, and my educated guess is that it generally does what it claims to do: prepare students to pass certifications. Assuming students have the discipline to put in the necessary amount of work, it should go a long way toward helping them reach their goals. 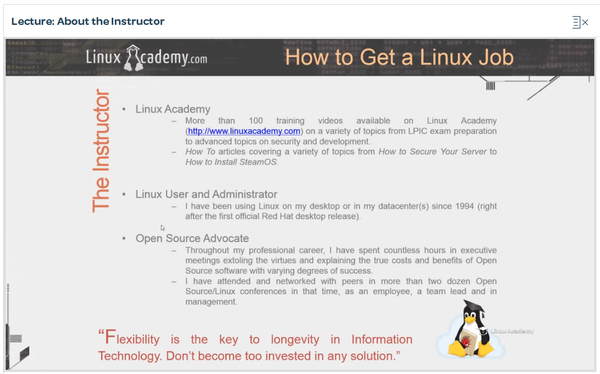 Linux Magazine Academy - Attractive Discounts and LPI "Partner of the Month"
The Linux Magazine Academy is offering 20% off all their online trainings until January 15, 2012. Depending on the course chosen customers can save several hundred pounds. 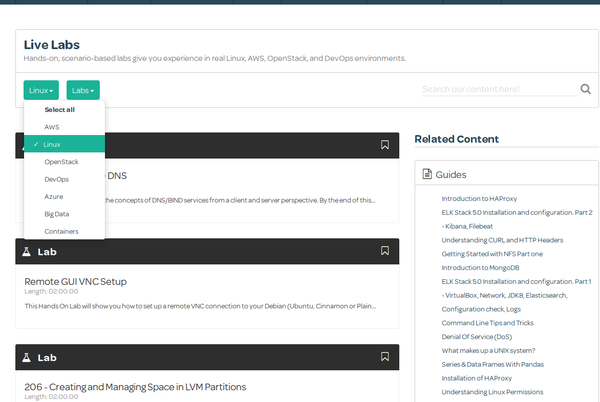 New Linux online training comes complete with video streaming. In partnership with technology business solutions provider Netways, Linux Magazine Academy now offers online training for the Nagios monitoring infrastructure.